You are standing in Eternity, you don’t perceive it because your mind has been conditioned to see otherwise. Tomorrow and yesterday are just thoughts, they are not real because they never are experienced. Now is all there is and Now is made of Presence. Time exists relatively from an objective point of view. Sunrise and sunset are real and define morning and evening. There is 24 hours in one day, 60 minutes in an hour and so on. But even from that point of view, it is all relative, it is based on a specific environment, planet size, solar system, and other physical parameters. Even then, all it takes for you to have a glimpse of eternity is to imagine that you are standing in the center of Sun, time suddenly stops (still relatively) but your mind realizes that time is flexible. The substance is bound to the law of cycles and therefore to the relativity of time. Presence is objectless and beyond cycles hence it is synonymous with Now. 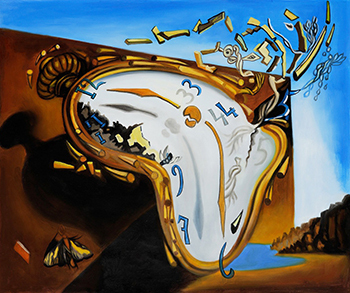 Time is a relative concept bound to the law of cycles and the subsequent alteration of the state of the substance. A cycle can be seen as a circle but it is more correct, from the evolution of consciousness point of view, to look at it as an ascending spiral. As consciousness expands and the mind dissolves, cycles morph into a point, the diversity is seen as one reality, the illusion of time fades and the reality of the Now is revealed. This entry was posted in Time and Cycles and tagged cycle, illusion, substance, time on March 6, 2016 by Calwen. Consciousness is like a screen. If you identify yourself to one of the character in the movie projected on the screen you will indeed have your own sense of reality and the other characters will have their own sense of reality. When you know you are the screen the perspective is different. The screen does not identify itself to any of the movies, it is the transparent space where all movies are played. The reality of consciousness is just consciousness.